* President Obama’s speech was awesome last night. * I think the crowd stood up so much it almost looked like an aerobic class! * I love how he inspires Americans to be our very best and to continue to push ourselves to the next level. * It was great to hear about banker Leonard Abess Jr. giving a phat $60 million to his current AND former employees. What style. This man will always be blessed! * Bobby Jindal is an idiot. It’s clear that the GOP putting him out there as their spokesperson for their response is a reaction to the Obama effect. It is consistent with Michael Steele being the first to head the GOP as well. 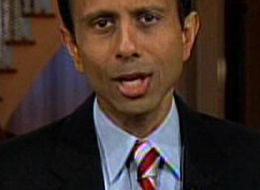 Back to Jindal, his speech was just hokey insincere and at times even insulting. The republicans are still spinning from the election and still do not get it. I wonder if they ever will. This entry was posted in Political, politics and tagged Abess, Banker, congress, Jindal, president obama. Man, I turned the TV off as soon as I saw their token representative of diversity. I dug that bankers move as well. That’s how you do it. He wasn’t hurting for it anyway, and now he will be blessed the more.